Monty has come for a Visit to play with the big boys. He arrived last night and was full of his Young Boy Energy. He thought he was going to come in and rule the roost. He had meet my German Shepherd this weekend so I knew they would get along. 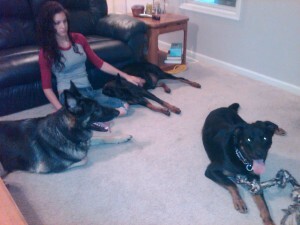 He ran in the house and meet Hagen and the RACE WAS ON. They ran through the house and played Tumble Wrestle as I call it for hours. I took these pictures after the boys had a drink of water and were resting for Round 2. 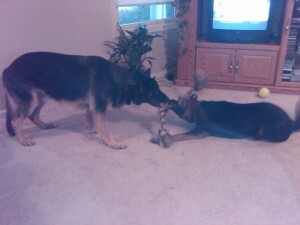 And then the TUG of War was on. Well we tackle the Swimming Pool as soon as the rain stops. And our Walks resume. Look for more Pictures as we have Monty for the week. Previous story 26 Day Old Puppies! !